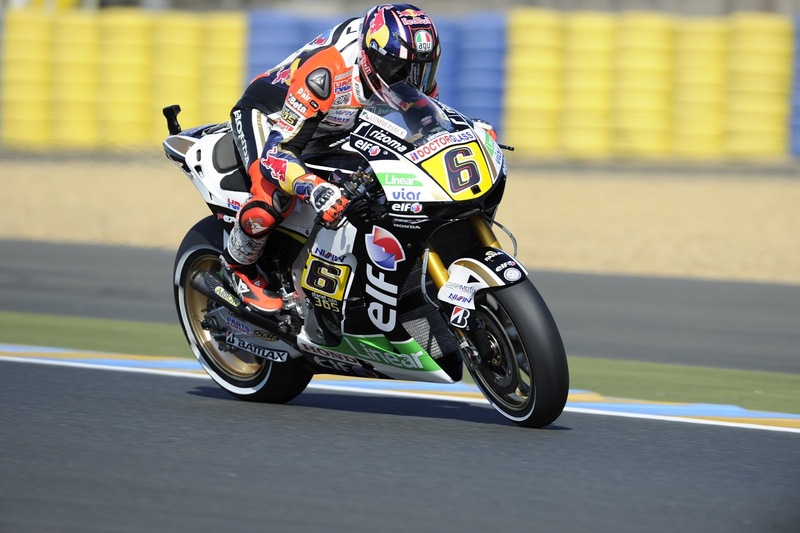 LCR Honda rider Stefan Bradl finished the opening day at Le Mans in fifth position, following changes to the set-up of his factory Honda. The German had a tough session in the first free practice this morning finishing in 9th, but the 23 year old was testing a new breaking system which enabled him to feel more comfortable on his RC213V. In a warmer FP2, Bradl was able to set a time of 1.34.299 which was only 0.264 off fellow Honda rider Pedrosa’s top time. Bradl revealed “This morning we have tried an updated braking system compared to the past because we think that the front tyre issue we had in Jerez is due to the braking system. Actually we made a big comparison this morning and, even in the afternoon, we lapped with this new system which gave me a good feeling immediately. We could improve our lap time and I had my standard bike back: this is the bike I like to ride and I am very happy about that. Now we have to work on the tyre life for the race because we are abusing the tyre a bit too much but so far it has been a good opening day for me and the team”.